In this letter I’d like to highlight robust information sharing and research resources available to IAMC members. In 2009, a member with a large U.S.-based chemicals company suggested IAMC create a process for quickly communicating with the Corporate Active members about urgent, late-breaking corporate real estate (CRE) business issues. The member modeled the idea after a method her company used to quickly brief hundreds of middle managers about important news. The company called these sessions “flash calls,” and IAMC adopted the same name for conference calls dedicated to getting fast answers to Corporate Active members’ questions. Most professional associations support their members by providing technical, management and market information. But early in IAMC’s existence it was not obvious to its leaders how to approach this challenge. After all, the commercial real estate industry already published tons of data. But soon it became clear what the Corporate Actives needed was trusted advice and input from fellow CRE professionals. Often, they did not know whom to ask and who could be trusted. So, IAMC’s leaders set out a code of conduct emphasizing ethical standards and behavior. Over time, the Corporate Active membership has become a community whose members share information with a high degree of confidence. Flash Calls were IAMC’s first foray to help the Corporate Actives work better by sharing advice, ideas and methods. The next iteration in this process was a service we call IAMC Special Information Requests. These dispensed with the conference call that characterized the Flash Calls. IAMC staff emailed the questions to the Corporate Actives, tallied responses and forwarded these to the question originators along with the names of the respondents. This worked well, and demand for the service quickly expanded. Next, to simplify the process and reduce the time required to deliver responses, IAMC invested to enhance its online member-to-member service. The new capability, called Cornerstone, is an online digital discussion board that enables all members to seek information and provide their own input to others’ questions. The service is flexible, allowing a question poster to define the member group to which the question will go. Today, when members have specialized questions, we can offer them three tools: Flash Calls, Special Information Requests and Cornerstone. But Cornerstone gets the most use because it’s easy to use and the responses come fast. To access it, go to IAMC’s website and click the button at the top. 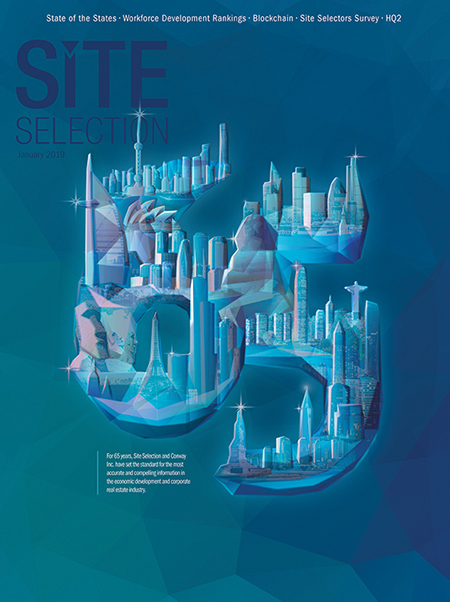 And let’s not forget another way we share information: IAMC’s official publication Site Selection magazine, which has reached a notable milestone with this 65th anniversary issue. Congratulations to Site Selection on its impressive service to its market and longevity. The publication’s relationship with IAMC began in 2002, the year the organization was founded. The alliance has created positive value for both IAMC and Site Selection. Lastly, the Santa Barbara Forum is coming up May 4-8. Register now if you have not already done so. We’ll provide strong CRE professional development workshops and top-notch speakers, notably including Steve Forbes. I know you’ll enjoy the city and its surroundings. To register, go to www.iamc.org. Editor’s Note: This article is excerpted from the Sept. 16, 2018, Philadelphia Professional Forum Business Impacts Interest Group session. The program was presented by Blaine Kelley, Senior Vice President, Advisory & Transaction Services, CBRE, and Richard Lawless, Director, Georgia Pacific Co.
Blaine Kelley provided a high-level overview of the supply chain and discussed how supply chain decisions affect real estate decisions. Richard Lawless reviewed Georgia Pacific’s different businesses and provided an overview of the supply chain for each business. Interest Group participants shared their observations about the intersection between supply chain and real estate, and offered observations about supply chain trends impacting real estate. The Council of Supply Chain Management Professionals (CSCMP) defines the common supply chain models as the Efficient Supply Chain and the Responsive Supply Chain. Efficient Supply Chain. CBRE thinks of the efficient supply chain as one that “makes to stock.” This is the traditional supply chain model used by most industrial companies. In this model, products are made and sent through a distribution channel. Areas of focus are costs and network efficiency. Responsive Supply Chain. These are supply chains for products that are “made to order.” They tend to be highly sophisticated, agile, flexible, and adept at customizing products. Boeing airplanes and Dell computers are made to order. In today’s e-commerce world, the general trend is toward more make-to-order supply chains where products are made and/or customized close to the customer. Among the Interest Group participants, most have make-to-stock supply chains, but every company’s supply chain is unique. Some have hybrids that combine make-to-stock and make-to-order. The general trend is that companies are moving closer to make-to-order, but doing so is hard and requires investment. Every supply chain must balance cost and service. While the real estate group focuses a great deal on rent, in many industries rent is a small percentage of total supply chain costs. Other factors such as labor, transportation and inventory are more significant. What is the company’s strategy for the future? What type of supply chain model is needed to support the future strategy? Where is the company today on the parabola, and where does the company want to go? The answers to these questions will affect the real estate strategy. Georgia Pacific has different supply chains for its different businesses. Building products. Products include plywood, lumber, gypsum products, and chemicals. Most of these are made to stock. The company produces products in plants and immediately puts them on trucks or rail, with few warehouses. Consumer products. This includes products such as paper plates, paper towels, bath tissue and various institutional paper goods. These are made to stock, and after they are produced are stored in 10 to 12 large distribution centers across the country. These products are stored close to customers, and the company keeps inventory on hand to provide high levels of service. Packaging and cellulose. This includes packaging materials such as corrugated boxes as well as bleached board, which is often customized for customers with printed information and is a made-to-order supply chain. The customized products are produced in advance, are transported to a warehouse close to the customer, and are stored until needed by the customer. Harmon Recycling. This business unit, which was acquired by GP, brings in waste paper, recycles it and acts as a broker. The company has labor-intensive facilities that take in paper, sort it, clean it, and ship it to end customers. The program participants offered comments on supply chain trends and the implications for real estate. E-commerce is disrupting everything. Companies in many industries — particularly retail — want to be closer to the customer and want to be able to customize products at the last minute. The growth of e-commerce businesses, especially Amazon, is increasing demand for warehouse space across the country. Companies with labor-intensive operations are looking into automation. Several companies have labor challenges that include finding enough labor to staff distribution centers, retaining employees and getting consistent performance. Automation can help address these issues. Corporate end users don’t see distribution centers going from 100 to zero employees, but could see them going from 100 to 50, supported by robotics and automation. Have logistics determine location. One participant felt strongly that too often companies first make a location decision and then deal with logistical decisions. He suggested first doing a logistics analysis and using that analysis to drive location decisions. By using a logistics analysis, a company can draw a large circle on a map where a site can be located. Then other factors can be considered to determine the exact site. Tariffs caused the C-level to tap the brakes. Tariffs were extremely disruptive for many companies because they created uncertainty and delayed major decisions. The desire to be close to the customer is causing companies to bring some manufacturing back to the United States. Some companies (particularly apparel companies) have had supply chains that involved sending raw materials to Asia, because the labor costs there were so low. Production would occur in Asia and the finished goods would be shipped back to the United States. But due to an increased desire for last-minute modifications, some production has been shifted back to the U.S. because the previous supply chain was taking too long.